I read this book on Kindle last year, and I reviewed it on it at Amazon just before I created this blog. My first 2 substantial posts refuted his major claims. I believe part of that Amazon review still stands as valid criticism of lots of statements attacking “the baby boomers”. So here it is, omitting parts that have been superseded in other posts. (I wrote the following before I realised that there wasn’t a “baby boom of 1945-65″). 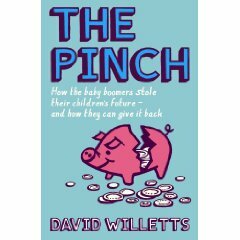 “The Pinch: How the baby boomers stole their children’s future and how they can give it back”). If this book had been advertised as a description of the importance of inter-generational cooperation, accompanied by useful social statistics, I would have given it more stars. But its real theme is instead identified by its sub-title: “How the baby-boomers took their children’s future – and why they should give it back”. It is an unjustified attack on the baby-boom cohort as a whole, leading to wrong conclusions about how we arrived at the current state and what the lessons are. Generalized criticisms made about baby-boomers are not supported by the (interesting) facts given, but needed a contorted interpretation of those facts. Another problem with this book is that is treats the baby-boom cohort as a sort of “collective intelligence”, to which criticism can be applied, injunctions be made, and motives assigned. Apart from the book’s sub-title itself, there is “the boomers increasingly came to think of their house as … their own personal goldmine”; “however, we [the author is a baby-boomer] thought we were richer and … we all became alchemists, converting paper increases in the value of our homes into extra money to spend”. (Etc). Perhaps he and some others did that, but many of us didn’t. The baby-boomers are about 10 million individuals. We span the complete spectrum of politics; of financial state (from rich to broke); of parental and social standing; of education; of health, of aspirations; of number of children. (But we probably don’t include rich footballers or WAGS!) We do not share a single agenda, strategy, motive, or degree of activism; in fact, we may sometimes not even be on speaking terms with one-another! Few of us ever managed to influence the resultant (current) society to a measurable extent. Since I gained the vote at the age of 21 my vote has never had the slightest effect on who got elected in local or general elections! And we are only about one-quarter of the electorate – does anyone seriously think that we really significantly influenced where we are now? It is my last paragraph above that identifies a fault with this and other books on this topic. Any failure to understand that we are actually 10 million individuals, connected only by age, just living our lives while the world changes around us in ways we can’t control and sometimes don’t even understand, may cause people to focus on imaginary agendas, and make false assumptions that we can act as one to change things for the “better” (whatever that means). Hence my single star, which reflects the failure of this book to understand what happened and draw lessons for the future. A generation is a group of people who have an “accident of birth” in common. A generation isn’t conscious, doesn’t have emotions, and can’t plausibly be collectively blamed. We must learn from the Second World War never to blame people simply for their accident of birth. This book fails to describe why things happened, therefore is of little use in solving problems. “Given the subtitle, How the baby boomers took their children’s future – and why they should give it back, I was expecting to find it uncomfortable reading (yes, I am one by Willetts’ reckoning, see below). But to my surprise, given the credentials of its author, I also found it to be flawed and I will try to explain why…. The UK experience was not the same as that of the United States which did have a sustained “baby boom”…. “Willetts is also convinced that “our culture is weighted towards the baby boomers” and takes pop music as an example…. “the Beatles in particular are in the top four of most popular musical performers for every age group, with the Rolling Stones not far behind”. Of course, the Beatles, born 1940 to 1943, and the Stones members in their 1965 heyday, born 1936 to 1943, all arrived well before the end of the Second World War…. In bolstering his argument, Willetts leaves no stone unturned, for example on page 129: “The two most violent riots in post-War London were the Grosvenor Square riots of 1968 and the Brixton and Broadwater Farm riots of 1985. They occurred around twenty years after each of the post-War baby boom peaks”. This ignores the four days of vicious rioting in London’s Notting Hill in 1958, and as the charts above show, the UK birth rate in the late 1930s was low….